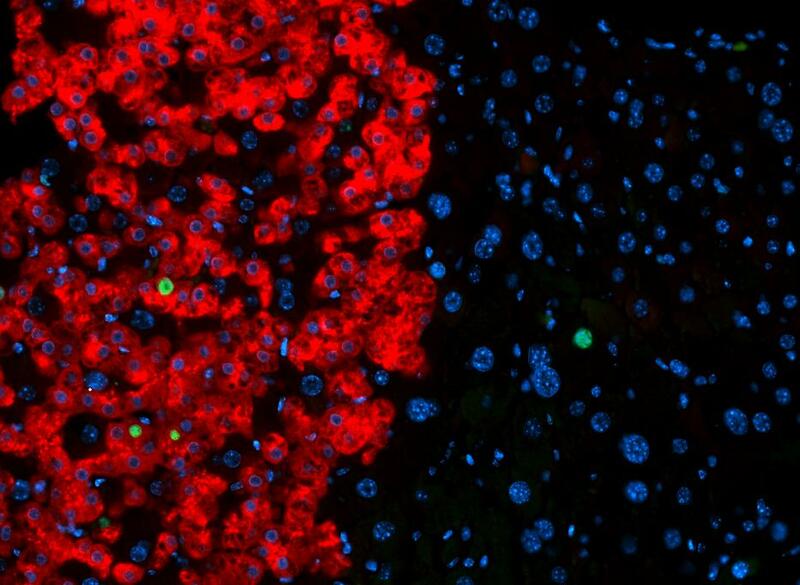 Caption: Cross-section of mouse liver containing iMPC-derived human liver cells (red), some of which are proliferating (green). All cell nuclei appear blue. Over the past few years, researchers have learned how to reprogram skin or blood cells into induced pluripotent stem cells (iPSCs), which have the ability to differentiate into heart, nerve, muscle, and many other kinds of cells. But it’s proven a lot more tricky to coax iPSCs (as well as human embryonic stem cells) to differentiate into mature, fully functional liver cells. Now, NIH-funded researchers at the University of California, San Francisco (UCSF) and the Gladstone Institutes appear to have overcome this problem. They have developed a protocol that transforms human skin cells into mature liver cells that not only function normally in a lab dish, but proliferate after they’ve been transplanted into mice that model human liver failure . This ability to proliferate is a hallmark of normal liver cells—and the secret to the liver’s astounding capacity to regenerate after infection or injury. This work is significant because currently the only treatment for liver failure is a liver transplant, which carries the risk of organ rejection and infections related to the immune-suppressive drugs used to prevent such rejection. More than 16,000 Americans are currently on the waiting list for liver transplants, and thousands die each year before a donated organ can be found. While this report is just an early step, it holds the promise of providing new liver cells from a patient’s own skin cells. This could help many people with liver disease without the use of surgery and immune-suppressive drugs, thereby freeing up the limited supply of donated livers for those who can’t be helped by any other method. Another advantage of iMPCs is that they may be somewhat safer for use in cell-based therapies. One risk associated with iPSC technology is that differentiated cells intended for therapy might occasionally be contaminated with undifferentiated iPSCs, which are capable of producing rapidly growing but benign tumors called teratomas if transplanted into the body. This should be less of an issue with iMPCs, because they never reach a fully undifferentiated state. To begin the reprogramming process, the researchers first used viral vectors to insert the OCT4, SOX2, and KLF4 genes into the DNA of human skin cells growing in a lab dish. After three days—once the skin cells had begun the reprogramming process—the researchers began adding a series of liver-specific growth factors and chemicals to the dish to encourage the iMPCs to differentiate into liver cells. After three months, the lab-grown liver cells—which closely resembled liver progenitor cells, but were not yet fully mature—were transplanted into a strain of immune-deficient mice that serves as a model of human liver failure. To test whether the transplanted cells had “taken,” the researchers drew blood from the mice and measured the levels of human albumin, a protein secreted by mature liver cells. After two months, human albumin became detectable in the mice’s blood and the levels increased continuously for more than nine months, which indicated that the human liver cells were proliferating in the mouse liver. In addition, when the UCSF scientists examined liver tissue from these mice under the microscope, they found the transplanted human liver cells had fully matured, making them indistinguishable from normal human liver cells. But there’s still much more to be done before we can even think about testing iMPC-derived liver cells for therapy. The researchers’ next hurdles are to figure out how to speed the maturation time for lab-grown liver cells, as well as how to modify their procedure so that the reprogramming can be done without using viruses, which carry a potential risk of cancer. It seems an important first step is made and a series of concerns about the use of virus are also presented. However, take into account that the functional unit of the liver is not the hepatocyte. Liver cirrhosis is a form of disorganized liver regeneration. This is indeed a great advance. But just like the mystery still associated with the derivation of induced pluripotent stem cells (iPSCs) from a skin biopsy, even while deriving induced multipotent progenitor cells (iMPCs)–one is not sure whether it is the fully committed skin fibroblast that gets reprogrammed or a sub-population of pluripotent stem cells present in the primary skin fibroblast culture! It will be very easy for a pre-existing VSEL (being pluripotent in nature) to respond to the liver specific cues in vitro and differentiate into hepatic progenitors/hepatocytes. Detection of human albumin in mice blood on transplanting the iMPCs is exciting and very promising. But I believe that this very exciting paper published in Nature indeed shows the regenerative potential of VSELs, which exist as a subgroup among primary skin fibroblast culture. If VSELs are enriched and properly manipulated – will result in a still greater advance in the field of regenerative medicine. But in order to achieve this, we need to be first convinced that VSELs exist and more importantly need financial support.